Whether for Christmas, birthday, retirement, or that special occasion, a weather station makes a great choice of gift, something that is both unusual and impressive, that will genuinely give hours of pleasure, and that is often the start of a rewarding new hobby. These stations are all easy to set up, requiring just a minimal amount of DIY to mount the outside sensors. They come with fully detailed instructions and we back up all stations that we supply with unrivalled after-sales support and service. We can usually offer quick delivery from stock for all standard stations (but please order in good time for Christmas). Don’t worry if you’re buying for someone else and know little or nothing about weather stations yourself. We have a detailed information pack available on request and our staff are experienced in talking through the pros and cons of the various station models with clients who may be totally unfamiliar with weather stations and their capabilities. With our special commitment to comprehensive after-sales support you can buy with confidence from Prodata Weather Systems. Just drop us an email or phone us (03336 664175) to make an initial enquiry. For anyone who has yet to experience the impressive benefits of linking the weather station to a PC, the Weatherlink data logger and software package will allow you to view data on your PC and to run a weather-reporting website on the Internet. The software is straightforward to set up and to use and will run quite happily on an older PC, possibly one that might otherwise be discarded. The Weatherlink data logger is also able to store weather data for an extended period (while you’re away on holiday for example) even when the linked PC is not switched on. Any Davis station can be connected to a PC but note that there are distinct Weatherlink products for older (Weather Monitor II type) and the current Vantage Pro 2 stations. Another option for owners of standard Vantage Pro stations is the Daytime Fan-aspirated Shield kit. This add-on device causes a current of air to be drawn through the existing radiation shield and allows the more accurate measurement of air temperature on calm sunny days. We expect this to be a popular accessory and is priced at about £150. Finally, there are two sensors for measuring the sun’s intensity, one for visible light and one for ultraviolet light, that can be added to all Vantage Pro stations. The Solar Radiation Sensor (visible) is the one usually referred to as measuring sunshine intensity, while the UV sensor is becoming increasingly important for health monitoring. 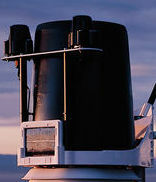 The two sensors are shown attached to their mounting bracket towards the top of the rain collector cone in the adjacent picture. The Solar Radiation sensor is priced at just over £200 (including mounting bracket) while the UV sensor is around £450.